It's Thanksgiving Day so it's time for turkey, stuffing, cranberry sauce, and hummingbird cake (at my house, anyways). But that's not the truly traditional Thanksgiving meal. The pilgrims and the Indians ate deer, codfish, and boiled pumpkin at the first Thanksgiving. There were no ovens for bread (or hummingbird cake) and there was no sugar or milk when Thanksgiving came around. The pilgrims ate their meal with their hands, spoons, and knives. They didn't have forks. The original Thanksgiving lasted three days. Turning Leaf Vineyard is hosting a Thanksgiving Tips Hotline. A panel of notable food, wine and entertaining experts will be standing by from 2 to 7 p.m. through Nov. 21 to answer questions on how to transform a traditional Thanksgiving meal into a memorable one for years to come. Call 1-866-99-TLEAF if you would like help from the experts. Would you like to celebrate Thanksgiving the way the Pilgrims did? 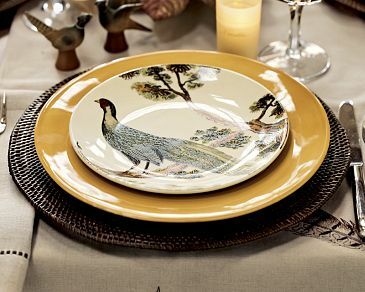 Then be ready for a departure from your traditional turkey, dressing, gravy, potatoes, and pie menu! 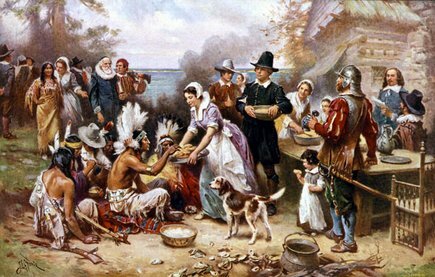 The Plymouth colonists and the Wampanoag Indians didn’t have a single meal for Thanksgiving in 1621. The harvest celebration was three days long, and included games, competitions, and storytelling, as well as meals, for around 150 people. For the full story from Mental Floss magazine, click here. domino magazine has a new Thankgsiving section that has everything from online sources for all-natural turkeys and pies to recipes and decorating ideas. They also have a step-by-step how-to for cooking a complete Thanksgiving dinner in one hour. Chef Mark Sullivan of San Francisco's Spruce shared his secret for a juicty bird with Food and Wine magazine (Nov. 2007). He wraps it in parchment paper, then foil; roass it at a low temperature until it's nearly cooked; then removes the foil and parchment and browns it in a hot oven until the skin is crisp. 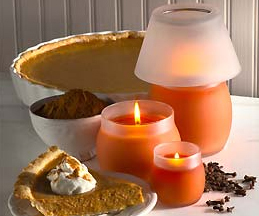 Get the smell of pumpkin pie in the air - without having to bake one - with these Pumpkin Pie-scented candles. The Dynamites featuring Charles Walker - Can You Feel It? Butterball Turkey TalkLine: 1-800-BUTTERBALL. Operates most weekdays in November until 8 p.m. and until 6 p.m. in December. Automated assistance also available. Butterball also offers turkey podcasts at www.butterball.com. Empire Kosher poultry customer hotline: 1-800-367-4734. Help is offered year-round Monday through Thursday 7 a.m. till 3:30 p.m.; Friday 7 a.m. till 2 p.m. Help is also available online. Foster Farms Turkey Helpline: 1-800-255-7227. Turkey-cooking questions are answered and information given 24 hours a day through Nov. 27. Help is also available online. Ocean Spray Consumer Help Line: 1-800-662-3263. Yearround, weekdays 8 a.m. to 3 p.m. Offers help with cranberries, as well as recipes, cooking tips, nutritional information and menu-planning worksheets. Help is also available on the Web at www.oceanspray.com. Perdue Consumer Help Line: 1-800-473-7383. Company representatives answer cooking, storage and other questions about poultry products most weekdays 8:30 a.m. to 5 p.m. Help is also available on the Web at www.perdue.com. Reynolds Turkey Tips Hotline: 1-800-745-4000. A year-round 24-hour automated hot line offers advice on turkey defrosting, preparation and cooking through December 31. Free brochure and recipes are also available. Information can also be found online at www.reynoldskitchens.com. U.S. Department of Agriculture Meat and Poultry Hotline: 1-888-674-6854 or 1-888-MPHOTLINE. Food safety specialists answer questions in English or Spanish about meat and poultry preparation and cooking questions, year-round Monday through Friday, 9 a.m. to 3 p.m., except Thanksgiving Day, when hours change from 7 a.m. to 1 p.m. Recorded information is available 24 hours a day at the same number. E-mail questions to mphotline.fsis@usda.gov.